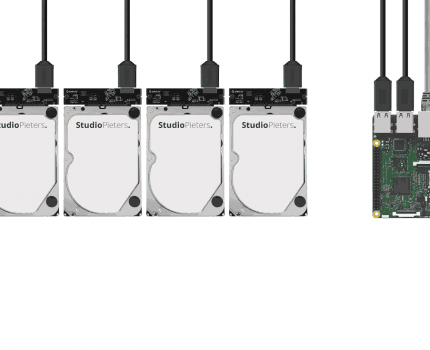 I want to extend my storage but it also has to be redundant, so I don’t loss any data that’s why I’m going to build a Raspberry Pi® 3 with RAID Storage using Some old 2.5″ HD drives, the Linux native RAID application MDADM. It’s pretty easy and shows you how to create a Linux RAID array which is a good skill to have. You can use Raspberry Pi’s from version 2 onwards, so 2B, 2B+ and RPi 3’s are fine, but I recommend the latest Raspberry Pi® 3. You’ll also need a good quality micro-USB power pack suitable for the Raspberry Pi® you’re using. We will be using some old 2.5″HDD drives for our RAID array. The drives should all be the same size and preferably the same manufacturer for a good RAID array however, if you have an odd one out, just make sure it’s the same size or larger than the smallest drive. USB 2.0 delivers up to 500 mA (at 5 V) and that’s enough for most 2.5″ HDD’s. Note: Do not use HDD’s witch use more power, this can harm your Raspberry Pi®. In terms of drive size, your budget will be the determining factor, so just get what you can afford. Remember that with RAID-0 you get the total amount of all drives put together, so 2x 64GB drives will give you 128GB. RAID-1 will halve your total capacity, so 2x 64GB drives will give you 64GB, and RAID-5/6 will give you roughly 2/3 of total capacity, so 3x 64GB drives will give you 128GB of storage. RAID-10 will halve you total capacity, so 4x 64GB drives will give you 128GB storage. Note: You can all so use USB sticks! In this blog we therefore we use a Raspberry Pi® and do a Raspbian Stretch Lite, a Minimal image based on Debian™ Stretch, installation, where you make a complete web server upon. This means that we will install Apache2, a database server MySQL and PHP support from the ground up. Visit the SD Association’s website and download SD Formatter 4.0 for either Windows or Mac. Follow the instructions to install the software. Insert your SD card into the computer or laptop’s SD card reader, select the drive letter for your SD card and format it. I’m using the lite image (no desktop / headless). Once you download the file, note the location of the *.img file. Visit etcher.io and download and install the Etcher SD card image utility. Run Etcher and select the Raspbian image you unzipped on your computer or laptop. Select the SD card drive. Note that the software may have already selected the right drive. Finally, click Burn to transfer Raspbian to the SD card. You’ll see a progress bar that tells you how much is left to do. Once complete, the utility will automatically eject/unmount the SD card so it’s safe to remove it from the computer. Take your SD card out of your computer and place it back so it can be mounted again. The command won’t physically eject the disk/card. It’s more of a logical eject: meaning it’s safe to remove the card now. You can also do this by right-clicking on the card on your desktop. The authenticity of host 'raspberrypi.local (xxxxxxxxxxxxxxxxxxxxxxxxxxxxx)' can't be established. just hit enter to accept the default (Yes). Type in the password — by default this is raspberry. Congratulations! You can now access your Raspberry Pi® over wifi! If you can’t connect, see the troubleshooting blog here. Last week I was trying to make my Raspberry Pi® work again, and while reinstalling and upgrading Raspbian OS packages I run into an issue where a perl warning is displayed. when you see this message and see that LC_ALL = (unset), and LANG = (unset) are (unset), then proceed with the fix. Save your changes, press CTRL + O, followed by Enter. Then press CTRL + X. After setting up the network connection, all I have to do is configure a static IP address and my Raspberry Pi is ready for use. Here I will show you how to set a static IP address on your Raspberry Pi® on Raspbian OS. Scroll all the way to the bottom of the file and add one, or both of the following snippets. Depending on whether you want to set a static IP address for a wired connection or a wireless connection eth0 = wired, wlan0 = wireless. Save your changes, press CTRL + O, followed by Enter. Then press CTRL + X. Now all you need to do is reboot, and everything should be set! Now we are ready to install MDADM. Now let’s move on to Setup RAID Volume & File System. Insert one of your USB drives (close any automatic windows). Go to Finder > Applications > Utilities > Disk Utility. Locate the USB drive from the left hand side and select it. Click on the Erase tab and choose the following options: Format: ExFAT, Name: USB01. Now click on Erase button, then confirm the Erase on the alert box. Repeat this process for each USB drive you want to use, increment Name: to USB02, USB03 etc. /dev/mmcblk0p1: LABEL="boot" UUID="CDD4-B453" TYPE="vfat" PARTUUID="498dcd43-01"
/dev/mmcblk0p2: LABEL="rootfs" UUID="72bfc10d-73ec-4d9e-a54a-1cc507ee7ed2" TYPE="ext4" PARTUUID="498dcd43-02"
/dev/sda1: LABEL="1TB01" UUID="8A44B0F244B0E1DD" TYPE="ntfs" PARTUUID="01411281-01"
/dev/sdb1: LABEL="1TB02" UUID="2CF48901F488CE90" TYPE="ntfs" PARTUUID="bd5d9029-01"
/dev/sdc1: LABEL="1TB03" UUID="A8CE3E46CE3E0D56" TYPE="ntfs" PARTUUID="0fb30d0e-01"
/dev/sdd1: LABEL="1TB04" UUID="3AC2CC7DC2CC3F3F" TYPE="ntfs" PARTUUID="0fb30d2b-01"
If you have different mount points than shown here, it doesn’t really matter, you’ll just need to replace the code snippets with the mount points you have. It also doesn’t matter if the drive labels are out of order, just so long as they match up to your mount points. Depending on how many drives you have (see RAID levels chart above) choose your RAID level and follow the instructions for your chosen level below. /dev/sda1: UUID="0d7c55bd-ae5f-8fbc-0e04-8a1579de5064" UUID_SUB="f954ff33-87db-4e26-8be9-e978aa0ef815" LABEL="RASPINAS:0" TYPE="linux_raid_member" PARTUUID="bd5d9029-01"
/dev/sdb1: UUID="0d7c55bd-ae5f-8fbc-0e04-8a1579de5064" UUID_SUB="eea15556-4e0a-1985-163a-064670df9db2" LABEL="RASPINAS:0" TYPE="linux_raid_member" PARTUUID="01411281-01"
/dev/sdc1: UUID="0d7c55bd-ae5f-8fbc-0e04-8a1579de5064" UUID_SUB="2a8456d7-6fea-eba2-7728-ebd20aa238e5" LABEL="RASPINAS:0" TYPE="linux_raid_member" PARTUUID="0fb30d2b-01"
/dev/sdd1: UUID="0d7c55bd-ae5f-8fbc-0e04-8a1579de5064" UUID_SUB="51019b58-995f-cf35-f6c3-33d61a104d76" LABEL="RASPINAS:0" TYPE="linux_raid_member" PARTUUID="0fb30d0e-01"
Now save Ctrl+O and exit Ctrl+X. 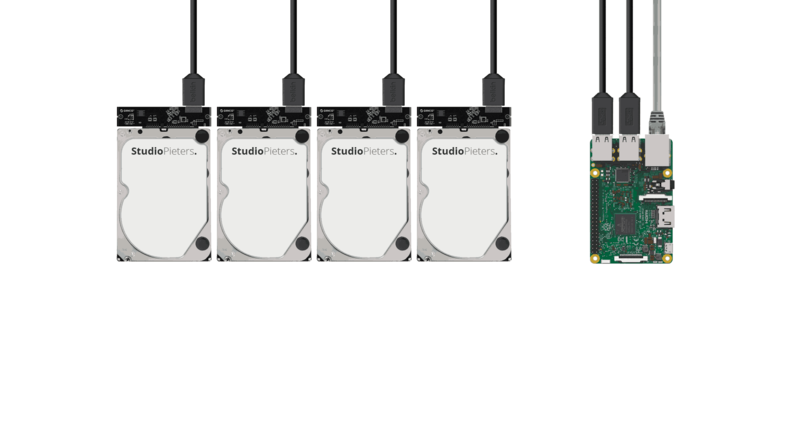 Now you have a Raspberry Pi® as a RAID array controller. Now it won’t be the fastest raid controller on the planet, but if you’re only doing a bit of streaming, and a bit of backup, and would like a bit of redundancy, then this solution might be for you. The performance will not compete with a real Raid controller. This because the Raspberry Pi® has USB 2.0 ports with a maximum speed of 480 Mbit/s (high speed). But it will do for your Small Office / Home Office setup.